1. Place the steaks in a shallow dish, add half the sliced garlic, the chopped oregano, 1 tbsp olive oil and seasoning, mix well to combine, then cover with clingfilm. Tip the prawns into another dish, add the remaining sliced garlic, olive oil and the lemon zest. Season, mix to combine, cover and chill with the steaks for 1 hour. 2. Preheat the barbecue (griddle or grill). Place the whole red pepper, tomatoes and red chilli on the rack above the hot coals and cook for 8-10 minutes, turning often until the pepper and chilli are blackened and blistered all over and the tomatoes are charred and softened. Remove from the heat and leave in a plastic food bag until cool enough to handle. 3. Peel off the skin from the peppers and chilli and remove the stalks and seeds. Skin the tomato. Roughly chop them all and tip into a food processor or blender with the chopped garlic. Whizz until smooth, add the sherry vinegar and extra virgin olive oil, season and blend again. Add more seasoning or sugar if needed. Stir in the parsley and set aside. 4. Cook the steaks on the barbecue, turning frequently until cooked to your liking – about 4-5 minutes on each side for medium. Remove from the heat, cover loosely with foil and leave to rest while you cook the prawns for about 3-4 minutes turning frequently until pink throughout and thoroughly cooked. 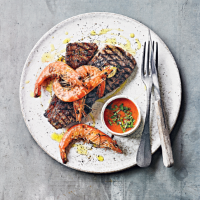 Serve the steaks with the prawns piled on top and the sauce alongside.